If you are an Instagram friend of mine (@shannasaidso) then you might have already seen what went down in my life the past few days. It pretty much entailed family, a blate, family and more family. Okay, I know, Halloween was over almost a week ago and doesn't have anything to do with the weekend, but I couldn't resist sharing this photo. This was right before we hit the streets for a few hundred Kit Kats, Skittles, Twizzlers and Snickers....and every other kind of candy known to man. We hit the candy jackpot...still not sure if that's a good thing. I headed out on Friday morning with Logan and 100+ second graders for a field trip to Pioneer Farms. It went better than expected and I actually learned a few things myself...you know, about Pioneer stuff...washing clothes by hand, blacksmiths, no electricity, horse and buggies, outhouses and taking baths in the same water as you entire family. Anyone wish they grew up in those days? Don't raise your hands all at the same time! Then we fulfilled our weekly Mexican food fix before I decided it was good idea to RSVP to a birthday party at Chuck E Cheese on a Friday night from 7:30 PM to 9:30 PM. I know, what in the world is wrong with me? I guess I am a kid at heart and even had a little fun by making myself an official Hip Hop Dancer club card. Be jealous. Very jealous. Saturday I headed to my old college stomping grounds, San Marcos, Texas, to meet one of my favorite blog friends, Andrea. It was our very first blate and I was late. I felt horrible. I am never late and it is a HUGE pet peeve. Sorry, Andrea, next time I will be 15 minutes early! Promise. Anyway, she is exactly how I expected her to be, sweet, beautiful, laid back and easy to talk to. We chatted and laughed for a few hours; a bit about everything. I feel like we have been friends for years and I can't wait for a double date with our hubs. Another IRL friendship made through blogging. 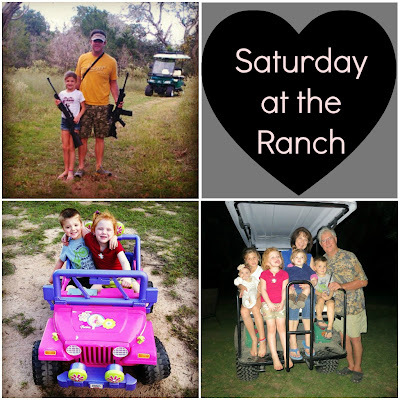 After my blate, the fam and I headed to Ross's family ranch for opening weekend and to celebrate my MIL's birthday. Eight adults and five kids...lots of noise and mischief. Enough ruckus to make only two brave doe come out. They knew we were there. How could they not. Good times. While the boys and Logan were off in their deer blinds, I walked down to the pond for a little Shanna time and to watch the sun set. I have about 20 more pictures on my phone. I was snap happy. I couldn't stop. The top left photo is actually a reflection of the clouds in the pond. I think I might end up framing this shot. I just can't capture these moments and find time to "reflect" in the city. It is always so refreshing and calming to sit and watch Nature do it's thing...alone with no noise or life's distractions. Last, but certainly not least, the Texans pulled another win yesterday. I am not celebrating just yet, but I think we just might be Super Bowl bound this year. New Orleans, here we come! I heard rooms are already all booked up, anyone want to offer us a bed to crash in? If not, my Yukon is looking pretty good. Ross and I will find a way to make it happen...if it happens. 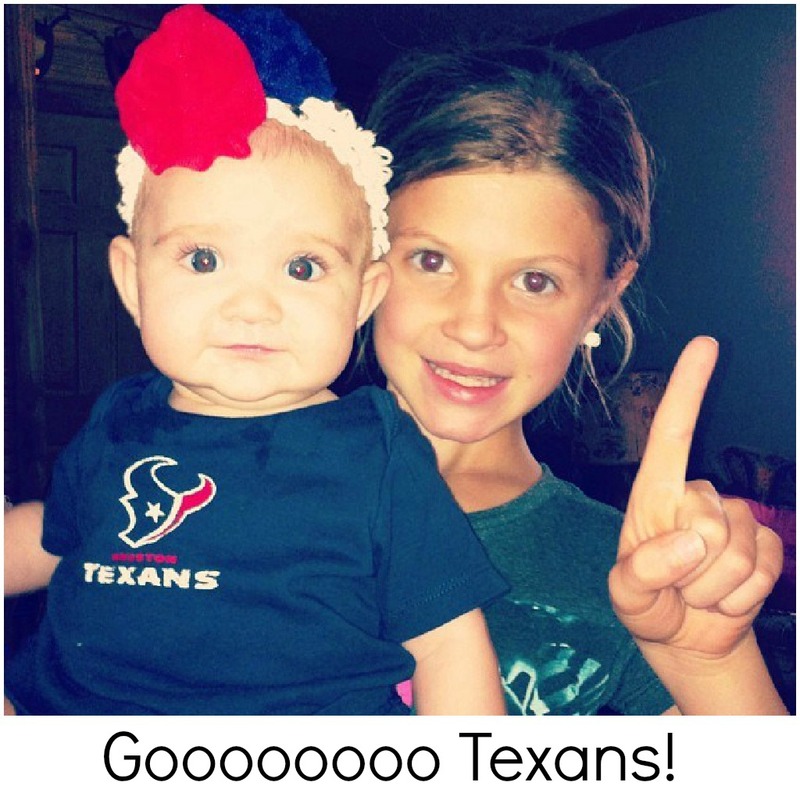 And isn't my niece the cutest in her Texan gear? So, what were you up to this weekend? Family? Friends? Or a little bit of both? 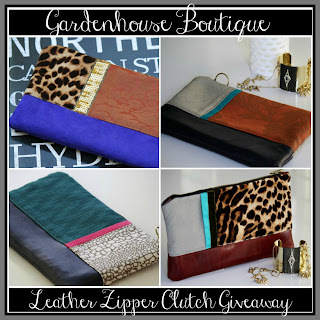 Don't forget about the clutch giveaway going on right now. Go enter! I'm envious of anyone in the same time zone as the Texans. We stayed up as late as halftime last night. They would go to the SuperBowl the year we moved out of the country! Looks like a wonderful weekend spent with family and friends! I love recaps of everything I've seen on Instagram! You've had a good week! I had such a great time with you this weekend friend! It was amazing how we felt like longtime friends that just picked up without skipping a beat! 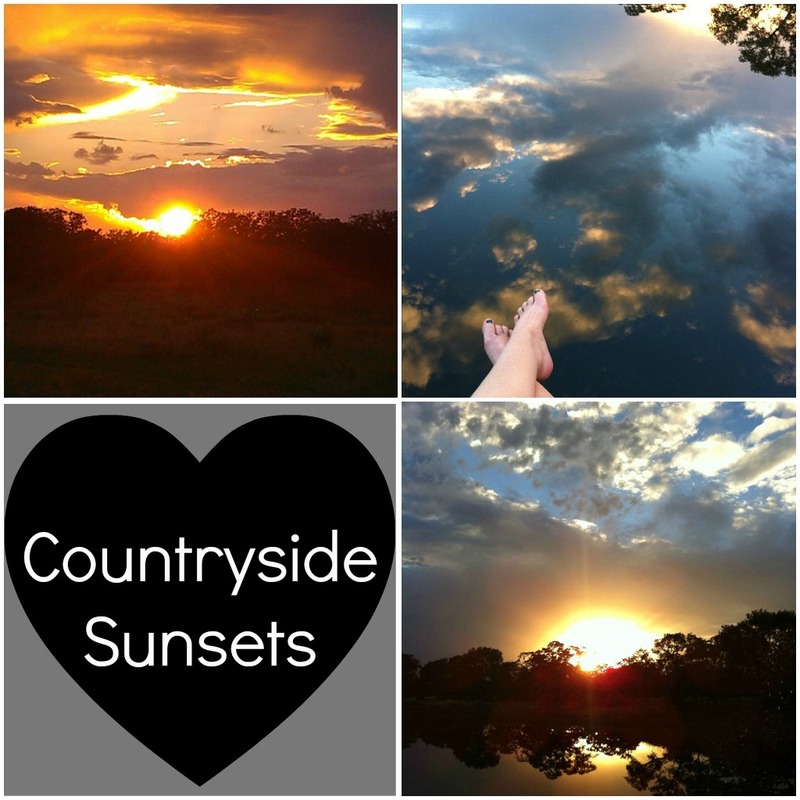 The Ranch looks so relaxing and I always love all of your sunset pictures! Have a great Monday! our class does a whole pioneer unit at the end of the year and we go to a place like that but all have to dress up like we are pioneers! what a wonderful weekend!! looks like a great time with Andrea!! and I am a total kid at heart too! i love the sunset shots, very beautiful. you should really get it framed. looks like you guys really had a fun weekend. and you make a beautiful cat woman. Yay you had a blate!! They are the best! So glad it went well, I mean, how could it not with you 2 lovely ladies? What a jam packed weekend! You are always so busy. Love your girls' costumes. They look so cute! What a fun weekend. So cool that you got to meet Andrea. I bet you two were the cutest, giggliest people wherever you had your blate! Those sunsets woman- INCREDIBLE. And is the 1st photo of you and your girls. I adore it. 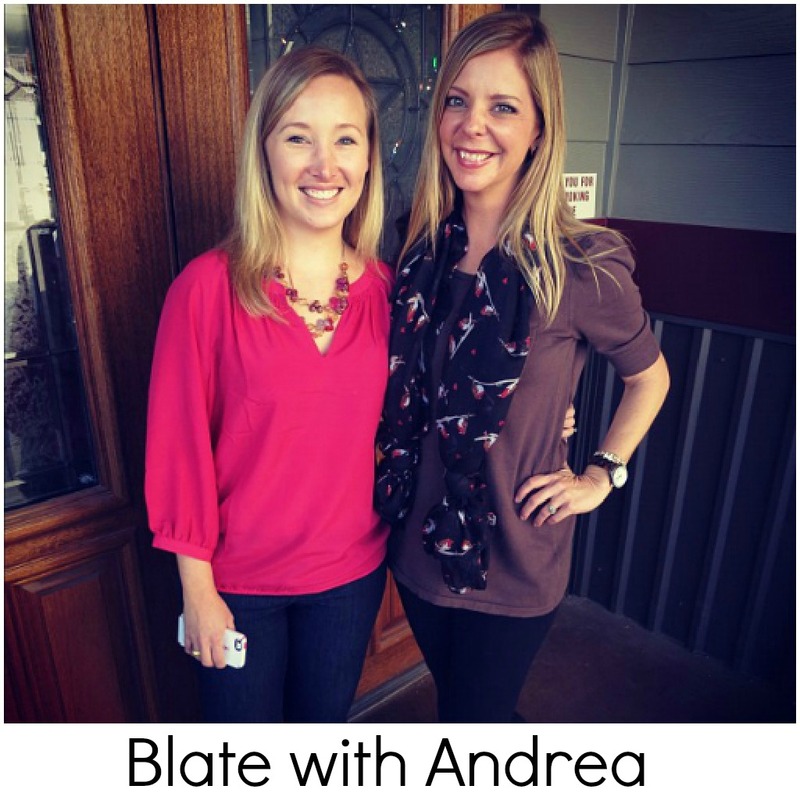 The blate must've been so fun with Andrea! Wish I could join you two :) And I love the Halloween photo, you guys look so cute! Good grief, it looks like y'all had a busy weekend! How freaking cute are your girls in their halloween costumes?! 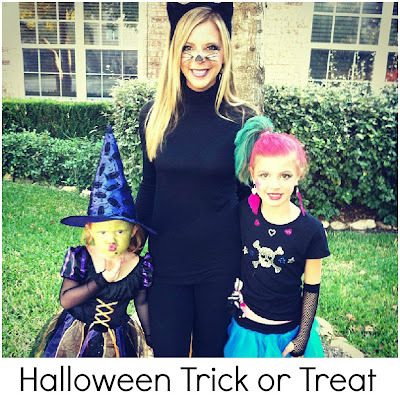 I am in love with that Halloween pic of you and your girls! Such pretties! And Logan looks just like you! I am also dying over your reflection picture. My family has a farm and it is my favorite place in this whole world. I was there this weekend and I'm already dreaming of being back for Thanksgiving! I love to see that you have the same kind of place in your family too! I'm so glad you and Andrea got to me, that is so fun! And can I just say, you are the prettiest cat ever... is that weird? Well, seriously, you are. Looks like the perfect weekend. Your sunset shots are just gorgeous as always. Just love that reflection. 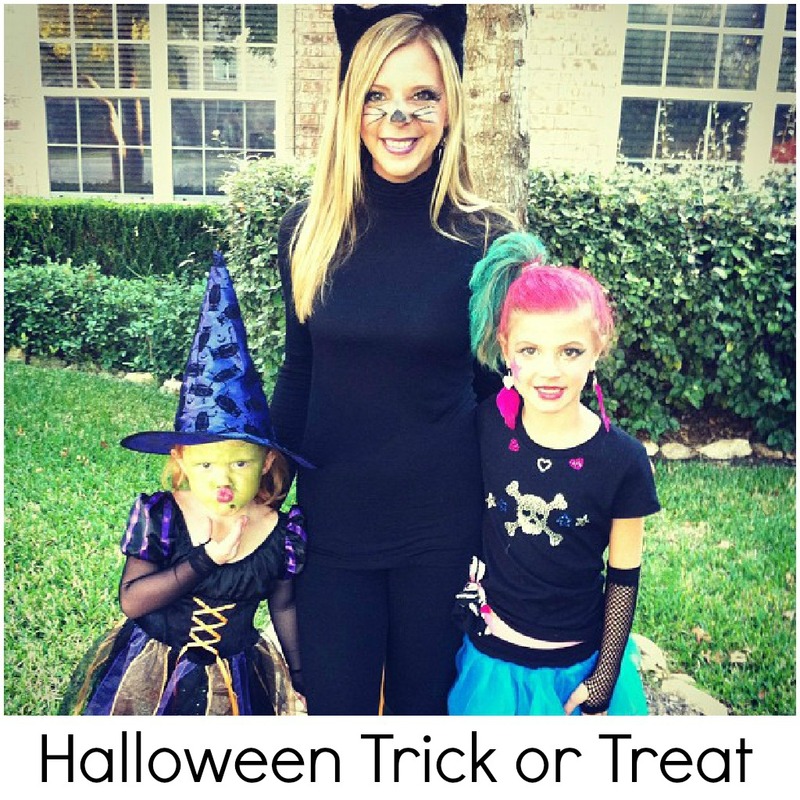 You and your kiddies look so cute for Halloween! Sounds like you were totally bored this weekend. Hell, you should have gotten out of the house and did something. It looks like such a fun Halloween & weekend!! Those sunset pics are gorgeous! That Halloween pic is so cute! Sounds like a fun and busy weekend! You really should frame that photo of the cloud reflection... it's gorgeous! What a fun blate! She does seem like a sweetheart! So awesome about your blate!! You two are so cute! What a weekend!!! We just need to make it work and meet up IRL! It's a must at some point in 2013 - how bout it?! Logan is quite the little outdoor-girl :) I love it!! These are such precious photos! I love the family costume photo! You guys looked awesome on Halloween! The girls costumes rocked! I love love love the Halloween costumes. You are such a fun mom! :) Those sunset pics are gorgeous! Sounds like such a perfect weekend! You are the cutest kitty, and your blate sounds phenomenal! Still wishing we lived closer! Those sunset pictures were amazing! 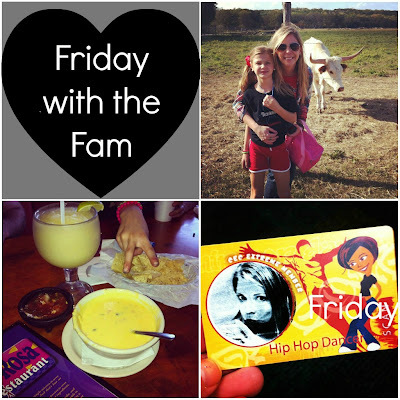 You amaze me with how much stuff you cram into the weekend! And that picture from Halloween... love it! What a great weekend! Sounds perfect! Your girls are so cute! Love their Halloween costumes! Looks like you guys had a great weekend too! The costumes are so cute! Love them. sounds like you had a GREAT weekend!! and i love the term BLATE. totally using that! I feel like I've been so out of the loop not having had power for so long! It sounds like you had a fun packed weekend! Your Halloween picture with the girls is great - you all look beautiful! And yay for blates! Your fam is the cutest! No, but for real!